My friends and family have caught on to me — at some point they realized that I write about phones for a living and don't just stare blindly at a computer, slamming the keyboard and occasionally cursing. That means I'm often asked Todd, what phone should I get?. I've already discussed why I think it's best for most consumers to hold off on buying an iPhone 4S now. That advice stands for most phones in general because I think we're about to be flooded with a ton of awesome next-generation handsets in the coming months. But if you're looking for an Android-powered smartphone now, here are my current favorites* in no particular order. The Galaxy Nexus was the first smartphone to hit the market running Google's brand new Android 4.0 Ice Cream Sandwich operating system. It runs on Verizon's 4G LTE network, offers a dual-core 1.2GHz processor, a 5-megapixel camera and a 4.65-inch Super AMOLED HD display. My only gripe with Verizon's version is it doesn't currently support Google Wallet for NFC-based mobile payments, but I suspect that functionality will be switched-on when Verizon starts activating its ISIS network in the second half of this year. The Galaxy Nexus comes at a price, though: Verizon is currently selling it for $299.99 with a new two-year contract. That's not exactly pocket change. I love that Verizon decided to bring back the iconic RAZR branding, and it did so by introducing the powerful and thin DROID RAZR. Then the carrier re-introduced a better version of the phone called the DROID RAZR Maxx, which offers much longer battery life. It was frustrating to see Verizon do this to customers who originally purchased the DROID RAZR, but I'd argue you're better off buying the Maxx for its improved battery life. The phone offers a 4.3-inch Super AMOLED Advanced display, a dual-core 1.2GHz processor, a reinforced case for added protection against accidental drops, an 8-megapixel camera and HDMI-out. But here's where the story get's real: the DROID RAZER Maxx offers a 3,300mAh battery that's rated for up to 21.5 hours of talk time. No more excuses for not calling your grandma on her birthday, ok? This big ol' bad boy is my phone of choice right now. It offers the largest smartphone display (5.3-inches!) currently available on the U.S. market. Dubbed a phablet by many (for phone and tablet), the Galaxy Note LTE offers a beautiful Super AMOLED HD screen, an 8-megapixel camera capable of recording 1080p video, support for AT&T's 4G LTE network, an S-Pen and corresponding S Memo app for jotting down notes or drawing pictures, a dual-core 1.5GHz processor and much more. The size might be a turn-off to some, but I haven't been able to put mine down since I replaced my iPhone with it. Plus, I'm dangerous against my opponents in Draw Something now that I have an S Pen to cheat with. The Galaxy S II Skyrocket is my second choice on AT&T because it offers a similar experience to the Galaxy Note LTE but in a smaller form factor. It has a beautiful 4.5-inch Super AMOLED screen, but it doesn't have an HD resolution like the Galaxy Note's screen — for that you'll need to wait for the Galaxy S II Skyrocket HD, which should land later this year. It also offers an 8-megapixel camera capable of recording 1080p HD video, a 2-megapixel front-facing camera for video chat, a 1.5GHz dual-core processor, support for AT&T's 4G LTE network and much more. I secretly wish it had the same stowaway S Pen as the Galaxy Note, but it doesn't. Verizon's HTC Rezound is a smartphone powerhouse that also adds excellent music features. It's equipped with a dual-core processor clocked at 1.5GHz, 1GB of RAM, a 4.3-inch 720p HD display, support for Verizon's 4G LTE network, Beats Audio integration for an awesome audio experience, 16GB of internal storage and a 16GB microSD card, an 8-megapixel camera and a 1.3-megapixel front-facing camera. The Rezound will only set you back $199.99, too, so if you're looking for a device with specs slightly higher than the Galaxy Nexus but for a bit cheaper, the Rezound is a solid choice on Verizon Wireless. You may have noticed, almost immediately, that Sprint and T-Mobile Android devices didn't make my top 5 Android smartphone list. That's not because I dislike either carrier — I think both are solid and offer excellent devices, including T-Mobile USA's brand new Samsung Galaxy S Blaze 4G. However, I don't think either currently offer smartphones that can go toe-to-toe with the devices listed above. T-Mobile's 42Mbps HSPA+ network, while fast, isn't as widespread and doesn't quite add up to the speeds found on AT&T or Verizon Wireless 4G LTE networks. 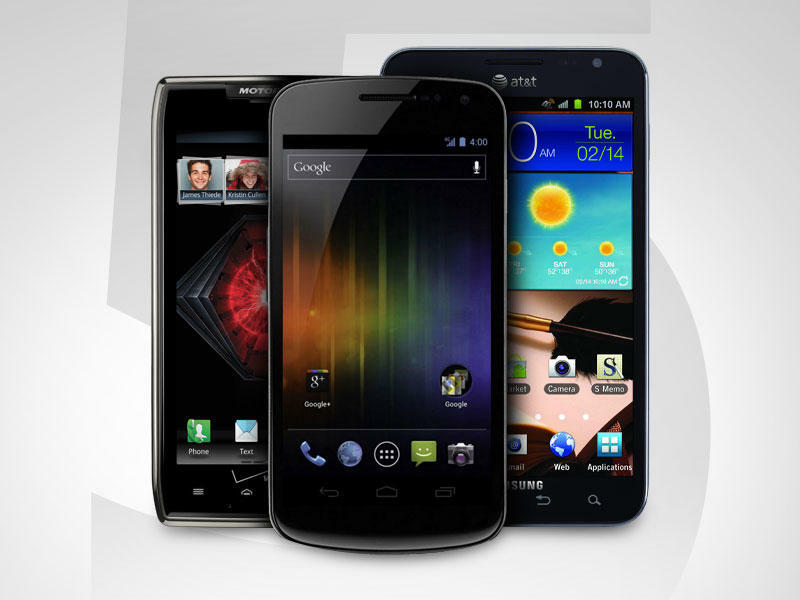 Sprint is working on its 4G LTE network and will offer the Galaxy Nexus and probably a version of the HTC One X later this year, but it otherwise hasn't updated its flagship Android smartphone portfolio in quite some time. Now, it's totally fine to disagree with my list. I can't wait for the new batch of smartphones that were unveiled during Mobile World Congress to hit the market. These are just the top five phones that I'd choose to carry with me if I had a choice right now. What are your favorites?